This image in an artists illustration of what propaganda from INGSOC would most likely have looked like in George Orwell’s 1984. The book itself acts as a warning to government take over. It was written in the 1960’s as communism was on the rise. However the image above refers to the text itself not the message it conveys to the reader. 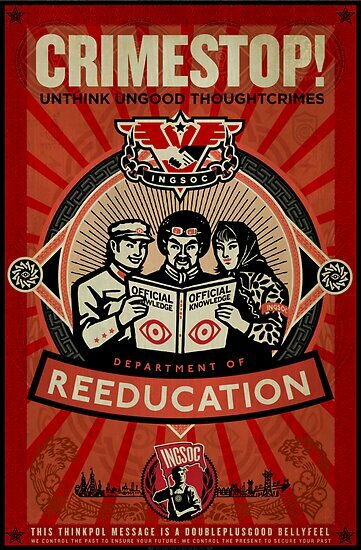 This artist depicts a poster that Ministry of Truth would have very likely used to control the populace. Anyone who sees this poster will first be struck with large heading that pops out from the dark red backdrop. By using large block letters, the words gain an impression of power and forcefulness as if they should be obeyed. “CRIMESTOP!” establishes an idea that everyone should be obeying and that is stop performing crimes. The smaller black lettering below it immediate addresses the understood question ‘How?’ raised by the decree of “CRIMESTOP!”. By putting these too statements immediately following each other, It doesn’t give the reader of the poster time to question the above statement. Instead it tells the reader what the answer of ‘How?’ so that the reader doesn’t have to think of an answer on his/her own. The poster puts ideas into the readers head to make sure that the reader won’t come up with answer him/herself. This helps the poster’s meaning gain influence over the reader and essentially attempt to make the reader become dependent on the ministry to tell them what the answers are to any question. By analyzing these four words and the way they are presented, it is possible to establish what the ministry behind the poster is trying to establish. In addition to the most important idea of the poster, there are pictures that support the words with good sensations. Without the pictures the words would sound extremely authoritative and demanding but the pictures of people smiling and the man proudly holding the flag of INGSOC support the authoritative words above. They make the words more trust worthy because the people in the poster seem to be happy when trusting the words too. I really like your point about the poster answering the reader’s next question he or she would have about it. The subtle indoctrination is brilliant and would be used by a totalitarian government. I did a bit of image searching and found remarkable similarity between this poster and other posters made for Nazi Germany and the Soviet Union, the most similar being Nazi Youth posters. The happy, young-looking people on both this and the real posters indicate a clear target audience: the up and coming generation. This is mostly because the biggest enemy to these totalitarian regimes are there own citizens. Closing sidenote: red seems to be the color of choice for these kinds of posters, presumably because it catches your eye more than any other color or it is the state color. I haven’t read 1984 unfortunately so I don’t know if it’s the latter. One of the things that I noticed about the image was it’s art style and color use. To put it simply, the image looks like something out of the Soviet Union. I think it’s interesting that the first thing I thought of when looking at this image was soviet union propaganda. This is because I’m so far removed from the cold war era timewise, however I still associate the color red and the art style of the image with the Soviet Union and harsh dictatorial governments. I think this because the association of the color red and dictatorship has mixed itself into our countries cultural mindset. The first thing that caught me when I looked at the poster was the big red eyes on the book titled: “Official Knowledge.” First of all, this shows that the INGSOC is controlling all knowledge in society, and the eyes are watching you, making sure you don’t think about “Unofficial Knowledge.” I’m very curious as to why there is two arms shaking hands in the INGSOC symbol, I think that may be symbolic of the “unofficial” contract between the government and the people, that the government controls your every thought. And the red colors are also very symbolic of control, like the others mentioned, which can be seen in Nazi Germany’s symbol and the Soviet Union’s symbol. This poster is very symbolic of the book, and I really wish I would’ve seen this it when I was actually reading the book!